Fashion Polish: NEW Lacquer Lust Suedes and Glitter Jellies review and restock info! NEW Lacquer Lust Suedes and Glitter Jellies review and restock info! I hope you're all having a fantastic weekend. I've had quite a busy week, busy but great. A couple of months ago I was offered the opportunity to sign up for First Aid training classes at work and I'm proud to say that I passed! We covered everything from First Aid, CPR and AED, it was all very interesting and enlightening. I highly recommend it. Today I have all of the latest Lacquer Lusts to share with you. New Suedes and Glitter Jellies! Chiffon is a pale beige with a cool shimmer flash that dries to a matte finish. The base color reminds me of the Earl Grey tea I put in my milk (I use a LOT of milk, I know...I know...). Formula was nice and easy to work with, I used 3 coats i my swatch below. Fuzzy Navel is a bright orange suede. I've probably said it a million times but I love orange. I surely can't resist the depth this one has. Application was flawless, a true 2 coater. Velvet Rope is a gorgeous blue based red that dries to a suede finish. Such an opulent red, perfect for the season. Again, 2 easy coats used below. Pink Lady is a hot pink suede with a subtle blue shimmer. Blue shimmer and pink base is a tough combination but it totally works here. Great application and 2 coats for complete coverage. 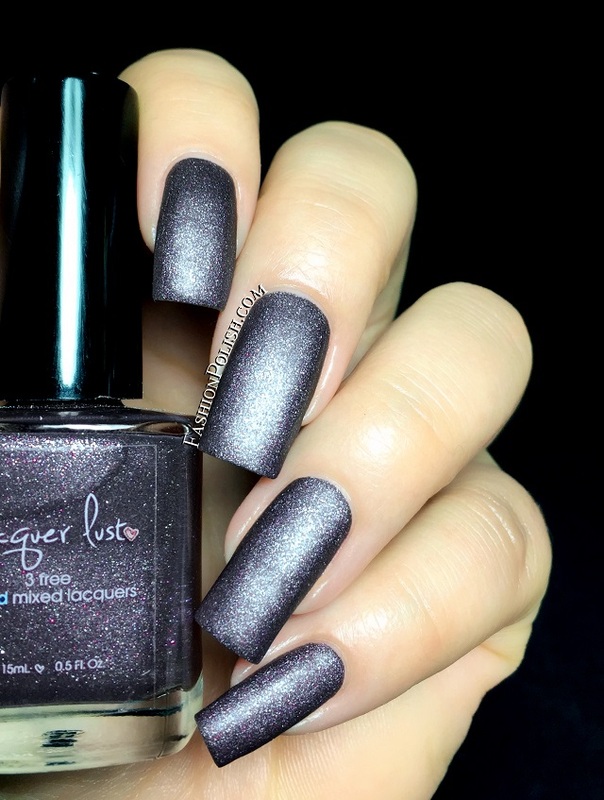 Purple hooter is a warm greyed-out purple with a strong blue shimmer and a suede finish. There's just so much dimension in this polish, mesmerizing. Coats used : 2 and no topcoat. Blue Moon is a bold sapphire blue suede. This one kept making my camera freak out, it literally glows from within. Nice and easy application, I used 2 coats for a change lol. Pining Over You is a deep pine green suede that makes the perfect Holiday pairing along with Velvet Rope. Coats used : 2, no topcoat. Clean Slate is a dark gunmetal packed with silver and magenta shimmers that dries to a suede finish. The silver particles really remind me of the original suede finish but it looks much more complex thanks to the extra magenta shimmers. Vampy and right up my alley. I also used coat in my swatch below. Lime Light is a lime green jelly packed with green and gold holographic micro glitters. If you love bold, you'll love it. It has so much dimension and sparkle! Formula was a bit thick but very manageable, 2 coats were used. Cool Water is a sky blue jelly with silver and blue holographic micro glitters. Another great glitter, the medium tone makes it very wearable no matter the time of year. Same consistency as Lime Light and 2 coats for complete coverage. Iris is a medium lavender jelly with silver and lavender micro glitters. There's a also a touch of holo micro glitters but it's very subtle. I also used 2 coats plus topcoat below. Simply Royal is a blackened royal purple packed with deep purple and holographic micro glitters. Another gorgeous vampy with lots of dimension and sparkle, I love it. Great formula and a 2 coats coverage. And finally Meet Me Under The Discoball is a gray jelly packed with silver micro glitters. A little thick but easy to apply and most importantly fully opaque with 2 coats! If you're looking for the ultimate silver glitter, this one might very well be it. Clean Slate will be available on December 1st.